The first thing you should indicate when setting up your widget is the name, language and country. The widget name will be useful for targeting purposes if you have more than one widget saved - once you define your target group you can connect the widget to it by selecting its name. Depending on why you need different widgets, you can name them Pricing if the differentiation is based on different departments (e.g. you would like to have a different text in the widget on the pricing page and on the main page), or English if you need different language versions of the widgets. By setting the widget language you can make use of the generic text that will be shown in the widget. If you would like to input your own text we explain how to do this in the Appearance section below. 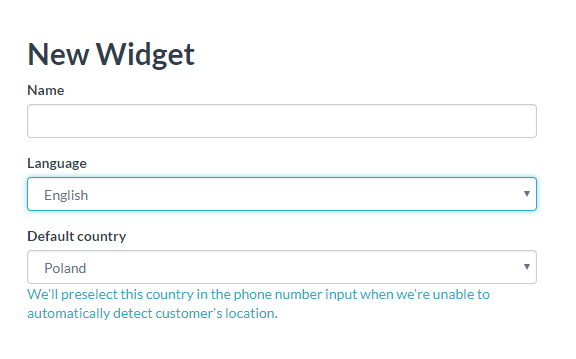 Thanks to the default country choice the widget will suggest the default country code to your visitors. By opening a drop-down list the leads will be able to select another country code. For more customisation guides, check out our other articles.